Product prices and availability are accurate as of 2019-04-07 04:28:04 EDT and are subject to change. Any price and availability information displayed on http://www.amazon.com/ at the time of purchase will apply to the purchase of this product. 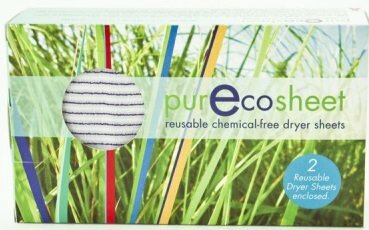 Pure Eco Sheet The first time you use these incredibly effective reusable, chemical-free dryer sheets you'll notice a difference in your laundry. 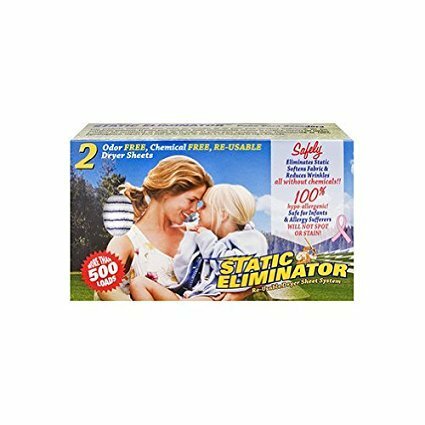 Unlike disposable dryer sheets you throw away after every load, Static EliminatorTM can be used up to 500 times - saving both money and waste. What's more, these hypoallergenic sheets are ideal for allergy sufferers because they're free of the harmful chemicals - three of which appear on the EPA's Hazardous Waste List - used in conventional brands. Works wonders at removing pet fur from laundry. Guaranteed to never spot or stain. 2 per box. 12"L x 7½"W.
These chemical-free sheets eliminate static, soften fabric, and reduce lint. They work at any heat setting and leave no residue. Care: Wash them in the washing machine every three months. How They Work The weave of the fabric gives them their static fighting power. Carbon fibers, which absorb static electricity, are woven within the fabric. This is a mechanical process; no chemicals are used.